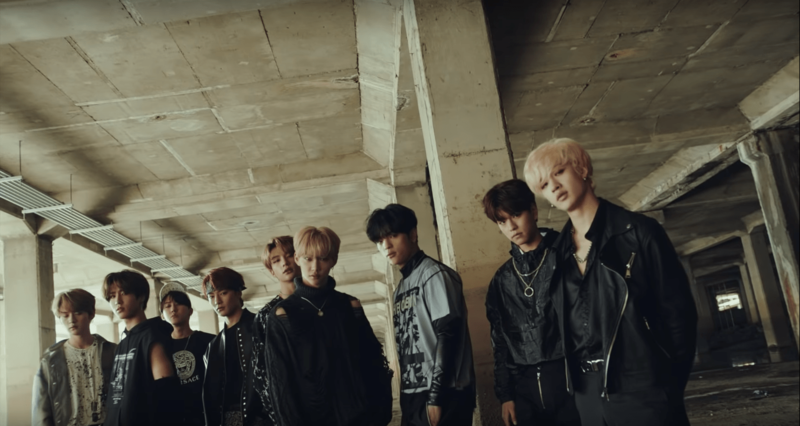 After postponing the release from April 4th to April 8th, Stray Kids have finally unveiled their performance video for ‘Victory Song‘, the third song on their latest mini album ‘Clé 1: Miroh‘. Check it out below! STAYs have been waiting to see this performance video since it was teased before their comeback. While promoting for ‘Miroh‘, the group also performed a shorter version of ‘Victory Song‘. Both Bang Chan and Han flash their abs, making fans anticipate this performance video even more. Fans won’t be disappointed as they do the same in this video! The performance video starts with a series of photos that flashback to the groups’ videos from last year. It looks like they have gone through a transformation. This has, in fact, happened as Bang Chan confirmed as it is part of their timeline. The video takes place in a tunnel. Throughout the video, there are shots of the boys posing in the tunnel. They have gone for a stronger and manlier image, fitting the mood of the song. Even the sky is dramatic with dark and heavy clouds and airplanes flying around. The choreography is just as powerful as the beats of the song. At the end of the video, the members sit atop a roof with pink lighters. Leader Bang Chan holds a flag with the group’s logo on it. What do you think about Stray Kids‘ performance video for ‘Victory Song‘? Let us know in the comments below.